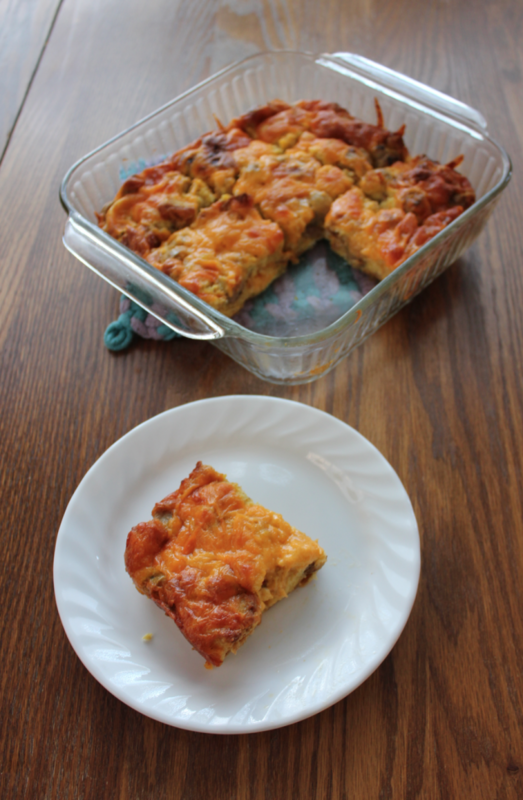 Looking for a quick and easy breakfast recipe? 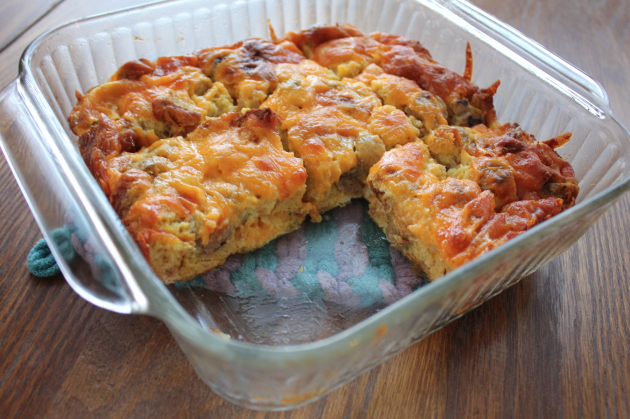 This simple Breakfast Casserole one is one we’ve loved for years. 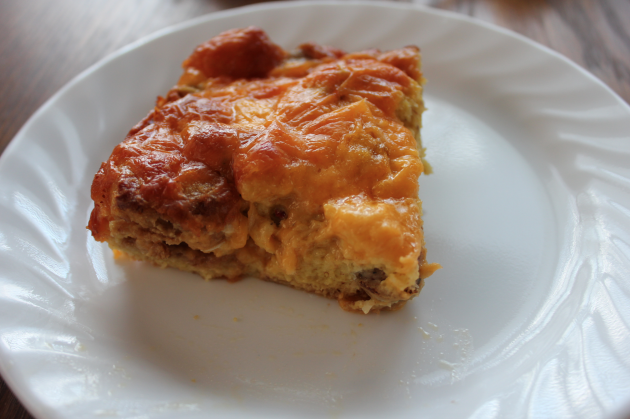 My mom used to make a Breakfast Casserole at Christmastime that we always looked forward to. 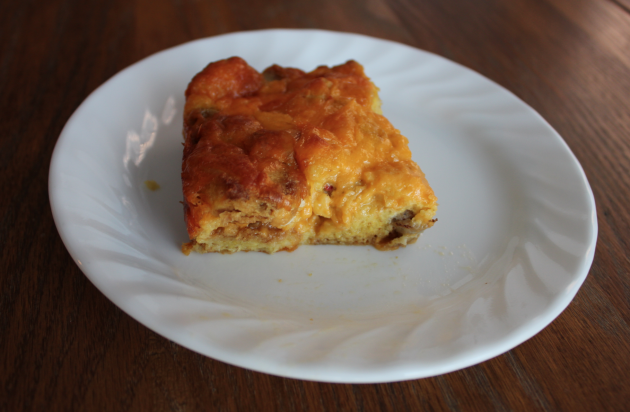 Her breakfast casserole recipe had a few more ingredients in it, but this version still brings back memories of those Christmas brunches. 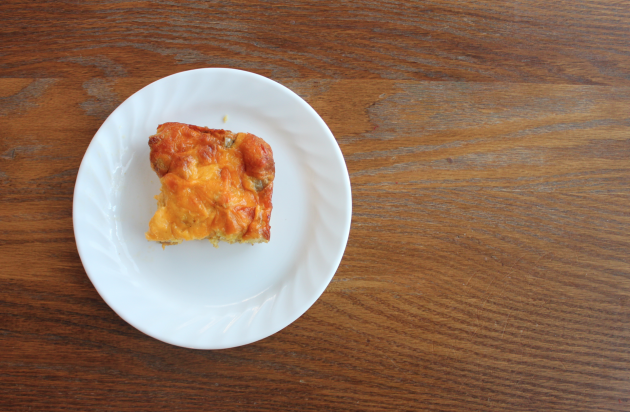 This pared down version of my mom’s Breakfast Casserole is one we ate often in our lean law school days. Any time I found a really amazing deal on cubed ham, I’d buy it up and package it in little baggies in the freezer to make this recipe. 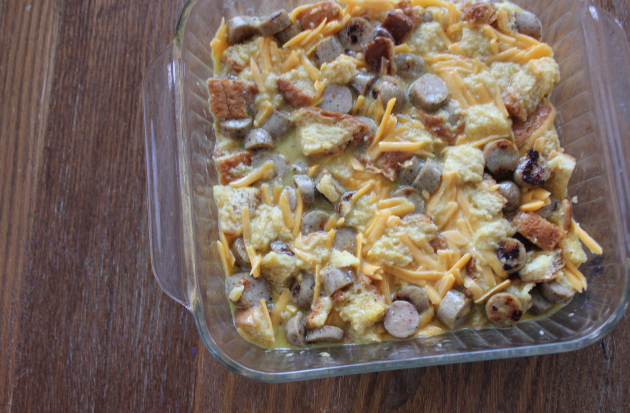 Then, I’d look for a deal on eggs and cheese and I had the makings of this casserole. We didn’t eat a lot of meat in those days, so this felt like a really extravagant meal, but it was one I could make for $3 or less per pan by shopping sales and it would make enough for us to get three dinners from. We’d serve it with whatever fruit I’d gotten on sale that week and it’d be a special dinner for us! My target price for dinners in those days was to shoot for $0.50 to $1 per meal per person and this meal fit that bill. We had such fond memories of it — and it’s one we still make today, even though we’ve raised our grocery budget quite a bit! 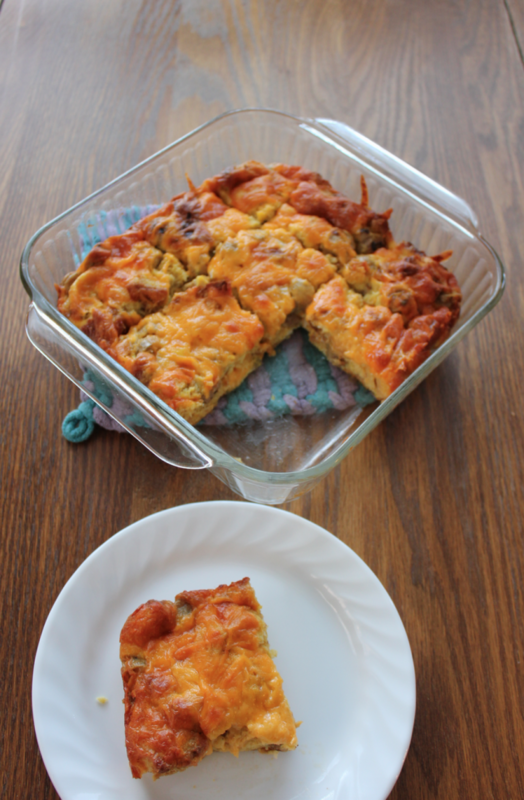 I love that this recipe is so versatile! You can add in chopped onions or peppers or spices to jazz it up. If your family likes spicier foods, you can serve it with salsa or hot sauce. 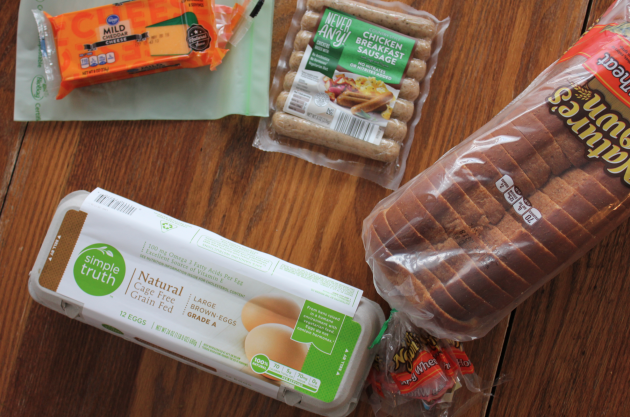 If you’re gluten-free, you can just use gluten-free bread. If you’re dairy-free, well, I can’t help you there. I’m just sorry that you have to live in a world without cheese! Lightly grease an 8×8 pan. Pour eggs into the pan. 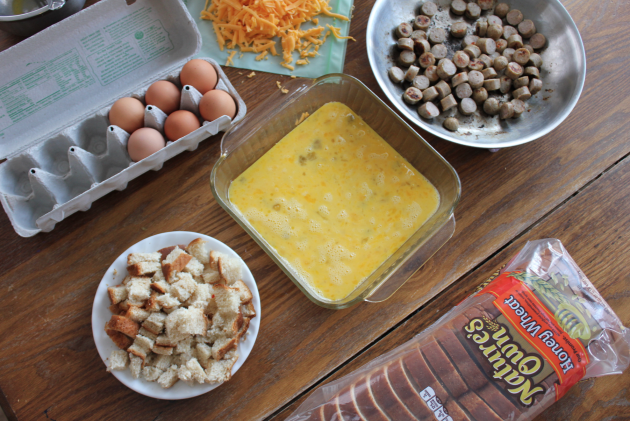 Mix the bread cubes, meat, and half of the cheese together. Spoon over eggs in the pan and press the ingredients down into the beaten eggs. 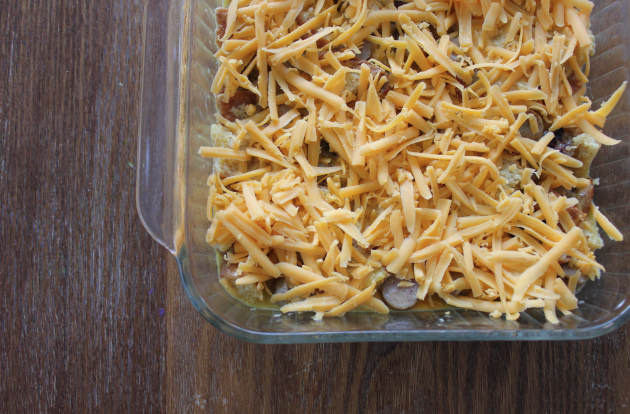 Sprinkle with remaining cheese and bake at 350 degrees for 20 to 30 minutes, until casserole is golden brown. 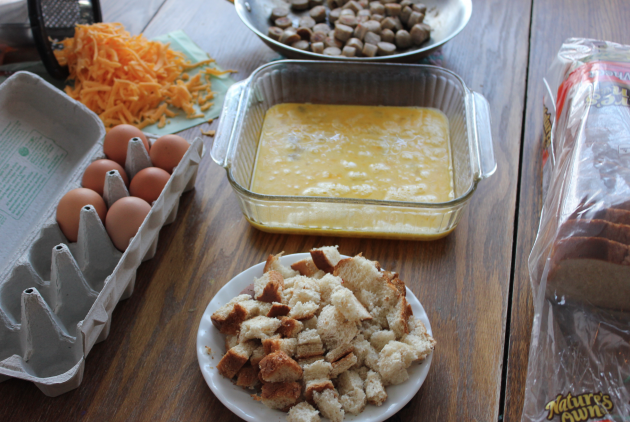 What’s YOUR favorite frugal breakfast recipe? Ahahaha. Harsh but I totally agree. Oh! Thanks for that tip! Thanks for posting. I can no longer have dairy. So I’ll have to try this cheese. Now I sort of, kind of want to try this dairy-free cheese! And it makes me so happy that there are substitutes out there like that! I’m clueless when it comes to dairy-free stuff! I used to make a dish similar to this in my pre-vegan days. Instead of bread, I used grits. Yum! And that would make it gluten free. So a win for those diets. Oh! That’s a great idea I would have never thought of! 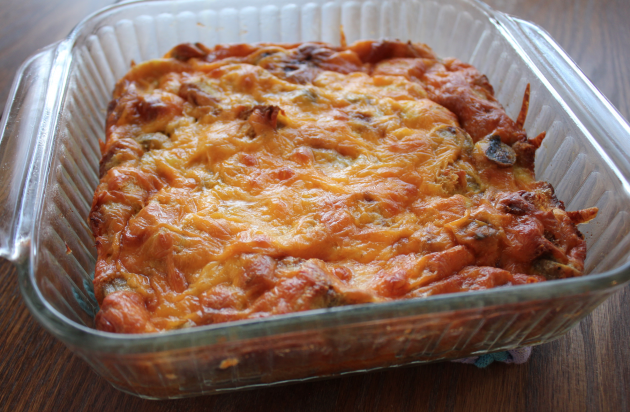 This can easily be made without cheese. My dd is allergic to dairy. I will make a small dish for her and a large dish for the rest of the family. It is easy to not want a food that can kill you, so she has no problem living without cheese.